Mistry, who became an Irish citizen in 2003 through his Irish born wife, has interests in real estate, cars, heavy industry, tea and partly owns the Taj Mahal Hotel. Mistry, who is in his 70s, reportedly has 18.4 per cent stake in Tata Sons. The 79-year-old Mistry is ranked 129th on the world billionaire list. He is also the 11th richest Indian. Mistry is an affable and humble person seldom willing to assert his authority or position. However, he carries a high degree of credibility in his business dealings. Noel Tata, Ratan’s half-brother and the son of Simone Tata, is married to Mistry’s eldest daughter, Aloo. Mistry’s sons Shapoor and Cyrus are on the board of Indian Hotels and Tata Power, respectively. The Mistrys have a huge construction company, Shapoorji Pallonji. Shapoorji, the group patriarch and Pallonji’s father, built some of Mumbai’s landmarks around the Fort area — the Hong Kong Bank, Grindlays Bank, Standard Chartered Bank and Reserve Bank of India building. 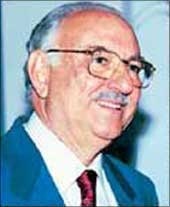 Pallonji Mistry extended the construction interests of the group to the Middle East by bidding for the Sultan of Oman’s palace.